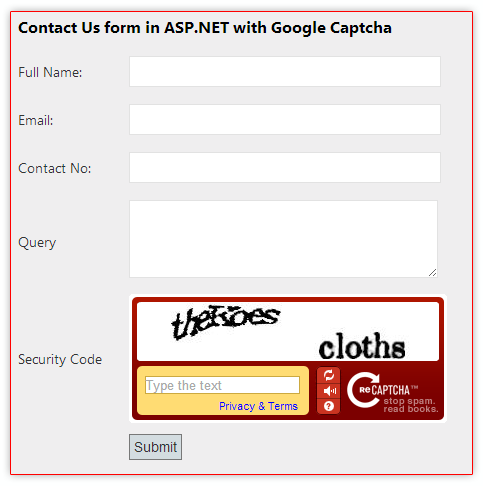 In this post, I am explain how to implement Google reCaptcha in asp.net MVC application without API. Let us learn about how to implement Google reCaptcha in asp.net MVC application without API. Step-6: Create a Controller . Here I have created a controller "ContactController"
Step-8: Add view for your Action & design for create form. Right Click on Action Method (here right click on Query action) > Add View... > Enter View Name > Select View Engine (Razor) > Check "Create a strong-typed view" > Select your model class > Select Scaffold templete "Create" > Add. Here is the function for get response from google api about validation of captcha code.